Penguins! Build your own emperor penguin family with the smallest building blocks in the world! The emperor dad and lad building set is fun for the whole family. 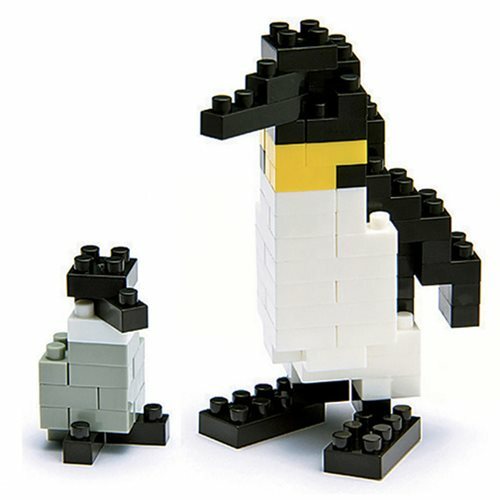 The average height of an emperor penguin is 45 inches, but the finished nanoblock dad penguin stands only about 2 2/5-inches tall, approximately 1/20th of the penguin's actual size. A fairly challenging building set for beginning building block fans, the Emperor Penguins Nanoblock Constructible Figure features over 100 micro building blocks, allowing you to build in greater detail. Ages 12 and up. Level of difficulty: 3 (on a scale of 1 to 5, with 5 being the most difficult).